William Claude Dukenfield (January 29, 1880 – December 25, 1946), better known as W. C. Fields, was an American comedian, actor, juggler and writer. 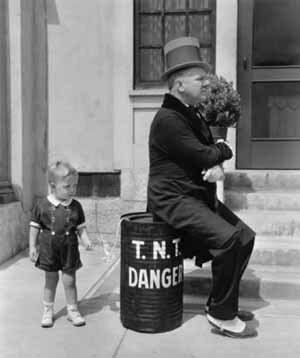 Fields was known for his comic persona as a misanthropic and hard-drinking egotist who remained a sympathetic character despite his snarling contempt for dogs, children and women. The characterization he portrayed in films and on radio was so strong it became generally identified with Fields himself. It was maintained by the movie-studio publicity departments at Fields's studios (Paramount and Universal) and further established by Robert Lewis Taylor's 1949 biography W.C. Fields, His Follies and Fortunes. Beginning in 1973, with the publication of Fields's letters, photos, and personal notes in grandson Ronald Fields's book W.C. Fields by Himself, it has been shown that Fields was married (and subsequently estranged from his wife), and he financially supported their son and loved his grandchildren. However, Madge Evans, a friend and actress, told a visitor in 1972 that Fields so deeply resented intrusions on his privacy by curious tourists walking up the driveway to his Los Angeles home that he would hide in the shrubs by his house and fire BB pellets at the trespassers' legs. Several years later Groucho Marx told a similar story on his live performance album, An Evening with Groucho.